Daniel Lam received a B.S. degree in Optical Sciences and Engineering from The University of Arizona in 2008, and a M.S. degree in Electrical Engineering from Stanford University in 2009. His research has been focused on digital broadband linearization of optical links and performing high speed measurements using time stretch technology under the guidance of Professors Bahram Jalali and Asad M. Madni. He is an engineer with Northrop Grumman Aerospace Systems since 2009. 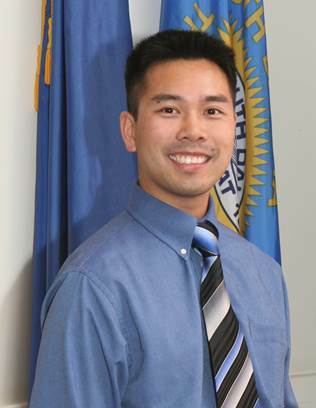 He is also a recipient of the Northrop Grumman Aerospace Systems Fellowship. 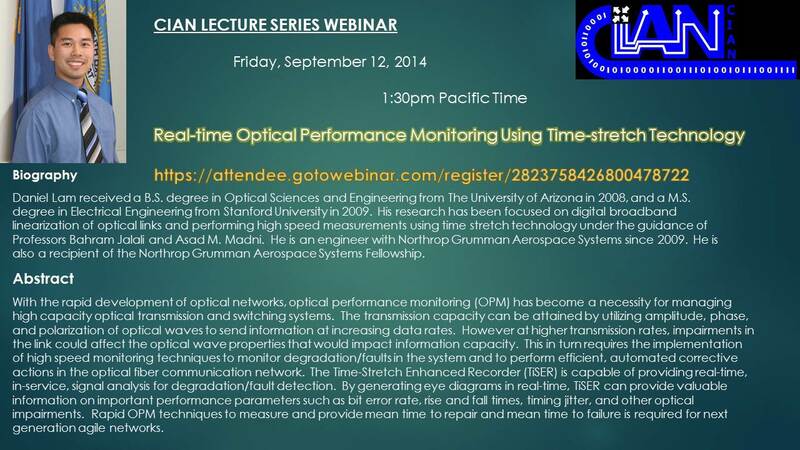 With the rapid development of optical networks, optical performance monitoring (OPM) has become a necessity for managing high capacity optical transmission and switching systems. The transmission capacity can be attained by utilizing amplitude, phase, and polarization of optical waves to send information at increasing data rates. However at higher transmission rates, impairments in the link could affect the optical wave properties that would impact information capacity. This in turn requires the implementation of high speed monitoring techniques to monitor degradation/faults in the system and to perform efficient, automated corrective actions in the optical fiber communication network. The Time-Stretch Enhanced Recorder (TiSER) is capable of providing real-time, in-service, signal analysis for degradation/fault detection. By generating eye diagrams in real-time, TiSER can provide valuable information on important performance parameters such as bit error rate, rise and fall times, timing jitter, and other optical impairments. Rapid OPM techniques to measure and provide mean time to repair and mean time to failure is required for next generation agile networks. This entry was posted in Research, Videos and tagged cian, CIAN Students, professionalism, UCLA. Bookmark the permalink.